White and clean is the new black when it comes to crawl spaces! 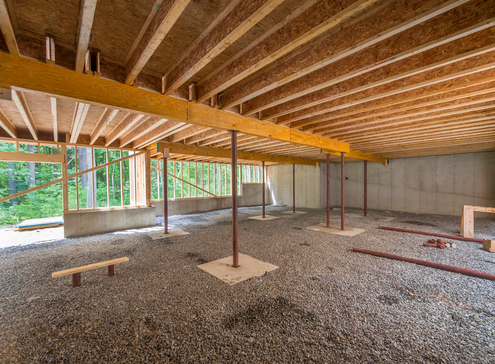 Did you know that ventilated dirt crawl spaces provide a source of moisture that can lead to mold, mildew, fungus and even structural decay. A crawl space can foster environments that lead to severe health issues, environmental moisture problems and increased energy consumption. Therefore, a crawl space needs to be sealed with a vapor retarder to help maintain humidity levels for occupant comfort, reduce heating and cooling costs and minimize other moisture related problems. 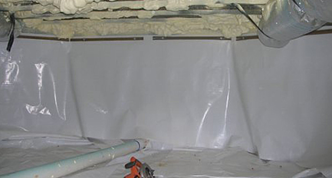 Now you can protect your crawl space with antimicrobial films and reinforced laminates that prevent the growth of harmful bacteria, fungi, mold and algae. The antimicrobial additive inhibits and/or kills bacteria, fungi, and mildew where the prevention of microbial growth is critical. Got Radon? Radon is a naturally occurring by-product from the decay of uranium in the soil. It can enter buildings through cracks in foundation walls and floor slabs. High levels of Radon in buildings have been linked to increased risk of lung cancer. The use of vapor retarders can effectively reduce the amount of radon entering a building when used as part of a complete Radon control system. Reinforced 3 ply. Laminate combining U.V. stabilized film with a high strength cord grid. Reinforced 5 ply. Delivers extra strength for applications requiring additional strength and puncture resistance. Reinforced 3 ply laminate. Provides high strength and durability in a lightweight material. A 3-ply laminate with an aluminum core surrounded by two layers of multi-axial oriented, high density polyethylene. Don't Put A Barrier Between Us! Contact us for any questions you want to discuss! Do you have a quick question? Click our Web form here please.